Cameron and Tyler Winklevoss just majorly upped their Bitcoin game. The venture capitalist twins, best known for their high-profile legal clash over Facebook, have officially launched the Winklevoss Index, or the Winkdex for short. The Winkdex, similar to CoinDesk’s Bitcoin price index, is a “blended price index that is designed to reflect the true price of Bitcoins,” according to a press release issued by the Winklevii, as the former Olympic rowers are sometimes referred to. The New York-based Internet entrepreneurs announced the inception of the Winkdex in a regulatory filing the pair made Wednesday to the Securities and Exchange Commission. The Winkdex, which, frankly, we think sounds a little too much like the household cleaner Windex, would be used to price the value of the cryptocurrency held by the Winklevoss Bitcoin Trust, an exchange-traded fund the brothers are hoping to gain SEC approval for. If the fund is sanctioned, it would be the first-ever publicly traded U.S. Bitcoin fund. "Math-Based Asset Index, LLC (“Index Provider”) [the twins' firm — ed.] developed, calculates and publishes Winkdex on a continuous basis using a patent-pending mathematical formula developed for such purpose. The formula provides a volume-weighted, exponential moving average market price by blending trading data from the largest Bitcoin Exchanges by volume on a list of Sponsor-approved Bitcoin Exchanges. Bitcoin Exchange criteria for inclusion as a Winkdex constituent include (i) trading denominated in US Dollar, (ii) availability of trading data, (iii) volume criteria and (iv) lack of recent trading halts. The Index Provider maintains a monitoring system that tests for these criteria on an ongoing basis." As of 11:52 a.m. 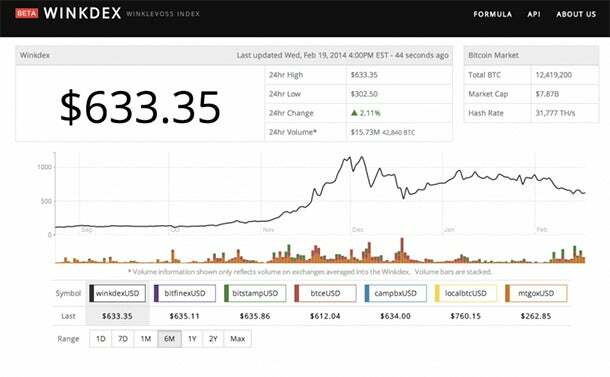 ET today, the price of the volatile virtual currency was $583.54, according to none other than the Winkdex, which already has a pretty slick website.